Delicate, decorative work made from Tempered Chocolate is almost impossible to comprehend at first glance. But like many seemingly impenetrable industry secrets, when someone actually lifts the veil, you discover that the answer is much simpler than assumed (or feared). Such is the case with Chocolate Bows. What may appear to be artfully woven lengths of Chocolate ribbon is actually a series of carefully arranged, individually formed Chocolate loops. Successful execution is a matter of careful planning and patience. No magic required. That said, if you're the type of person who feels that the recipe for Shake and Bake has too many steps, perhaps you ain't got time for this. For everyone else, I highly encourage you to try your hand at this one. 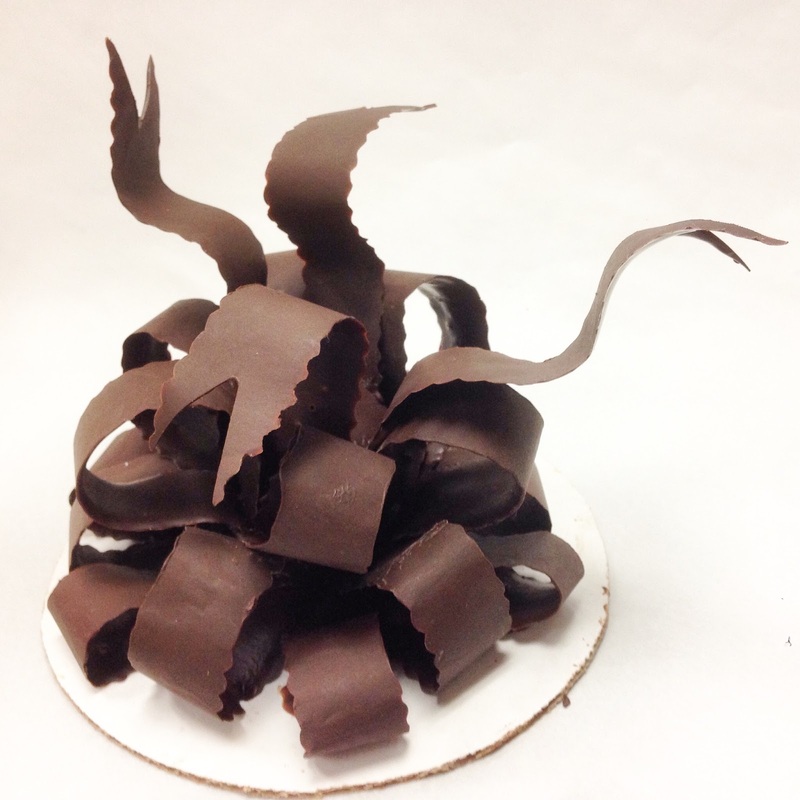 Remember, when working with Chocolate, even total disasters can taste delicious. 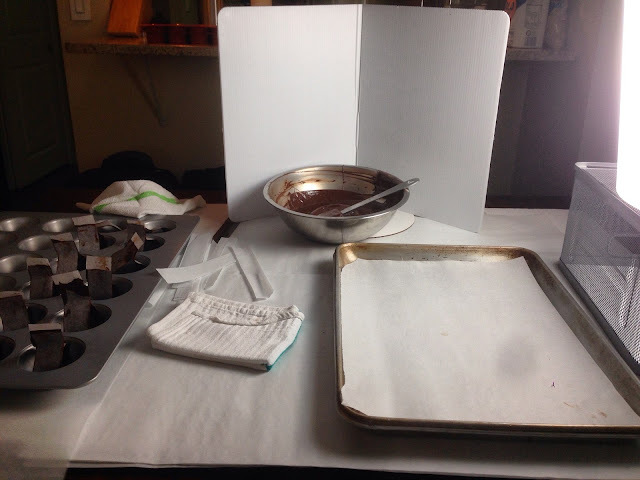 As with most pastry projects, the key to working with Chocolate is good planning and organization. Spend as much time as you need arranging your workspace, making sure you have all the tools, towels and ingredients necessary to complete your project. *Special photography lighting and reflectors not required. 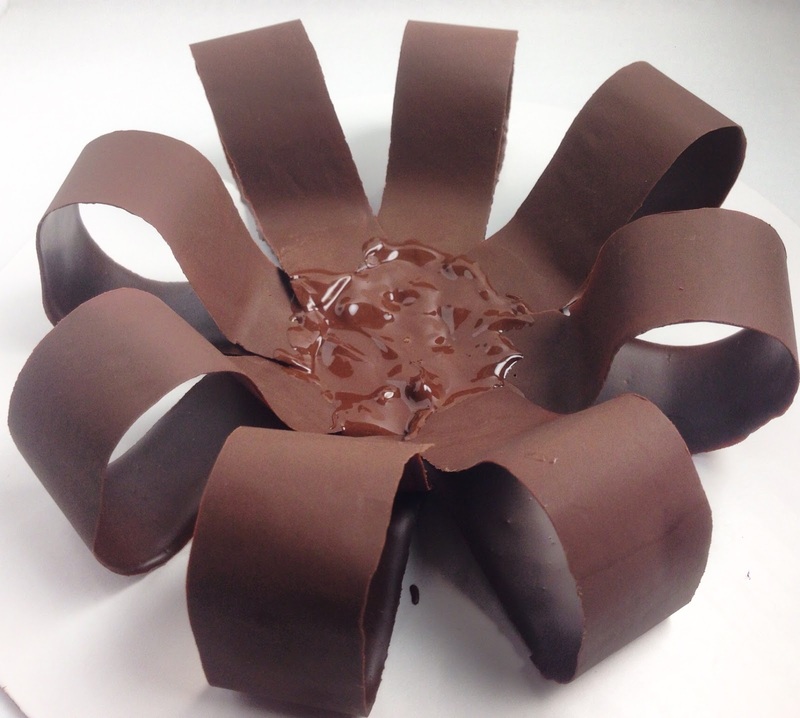 The Chocolate Bow is formed from a series of individual Chocolate loops. 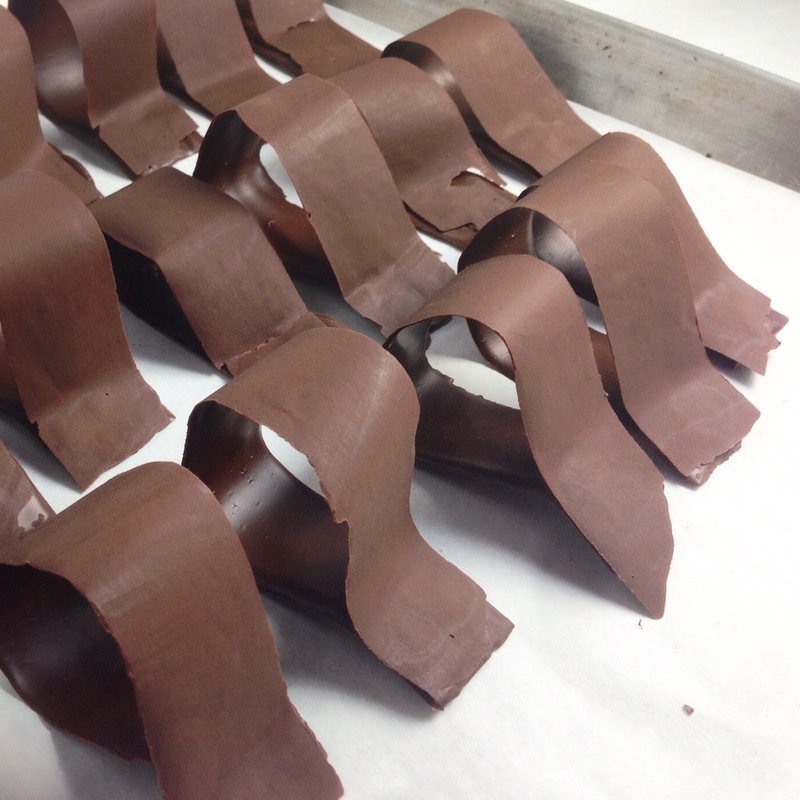 The loops are made by coating one side of previously cut strips of parchment with Tempered Chocolate. The Chocolate is allowed to partially set, and then the strips are folded into large loops. 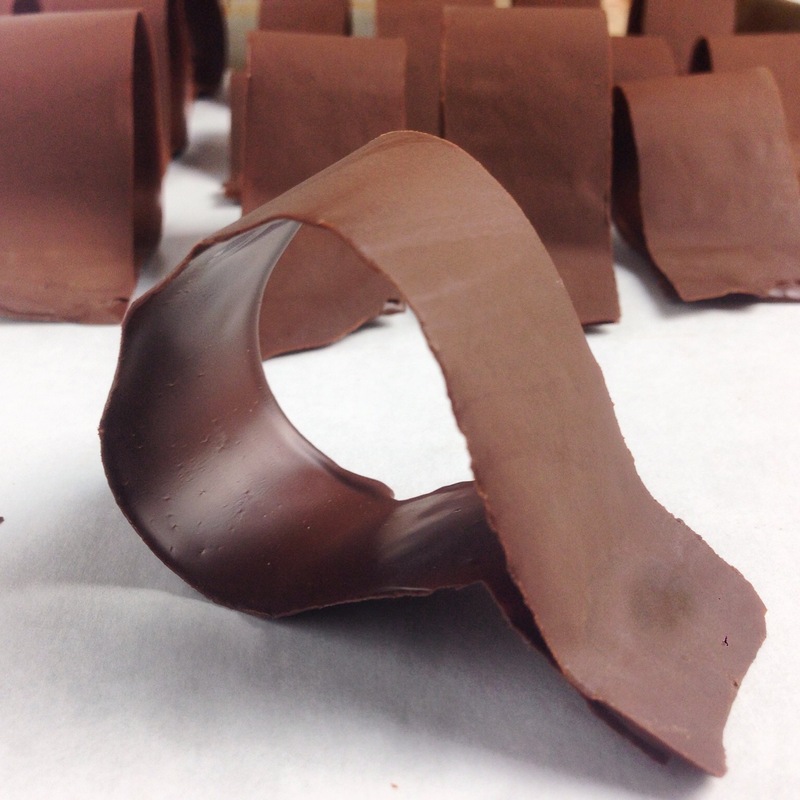 The formed loops are set aside so that the Chocolate can fully set. 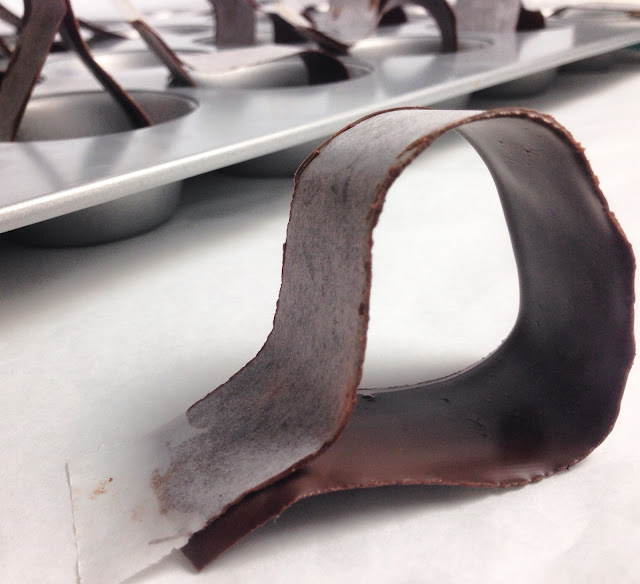 Once the Chocolate sets hard, the parchment is pealed away leaving a perfectly formed loop of Chocolate "ribbon". 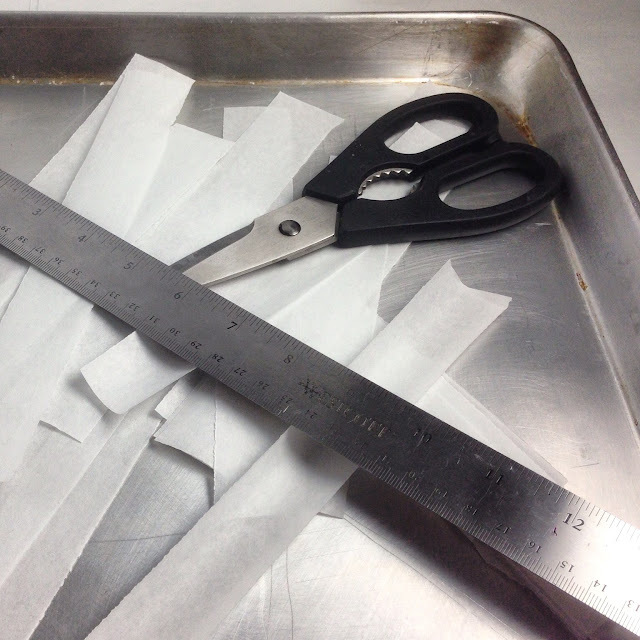 Begin by cutting the strips of parchment for dipping. The length and width of the strips can vary based on the desired size of your bow. However, 1" wide strips that are 8" long (conveniently half the width of a sheet of parchment) work well for most designs. As part of good planning, cut more strips of parchment than you think you'll need. A full sheet of parchment is good for 36 strips... so why not! When you break several Chocolate loops while assembling the final bow, you'll be thankful for the extras. Hope for the best, but plan for the worst! - While parchment is inexpensive and creates a clean, matte finish, use acetate for a high-gloss look. - For a more decorative ribbon, use decorative scissors for zigzag or wavy edges. While these ribbons will be even more delicate (the detailed edges melt quickly in warm hands), they will look extremely impressive. Once you have everything in place, temper the Chocolate and keep it in the holding range (approximately 86 degrees Fahrenheit). While the final bow does not require too much Chocolate, it's easier to work with a larger bowl (at least 500g). You can always save what you don't use. It's important to make sure that the Chocolate is well tempered. If it isn't, the Chocolate loops will remain soft at room temperature. You can always harden the Chocolate in the refrigerator, but do not confuse hard Chocolate with Tempered Chocolate. 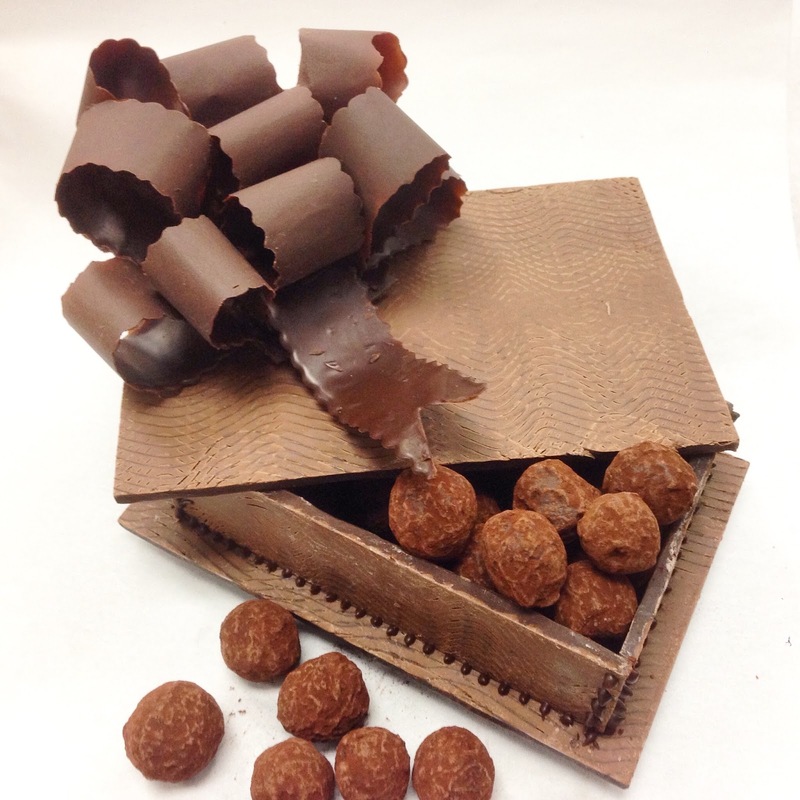 Cold, hard pieces of untempered Chocolate will quickly soften again at room temperature. And when you refrigerate Chocolate, you run the risk of creating white streaks or "bloom" through your egregious acts of temperature abuse. 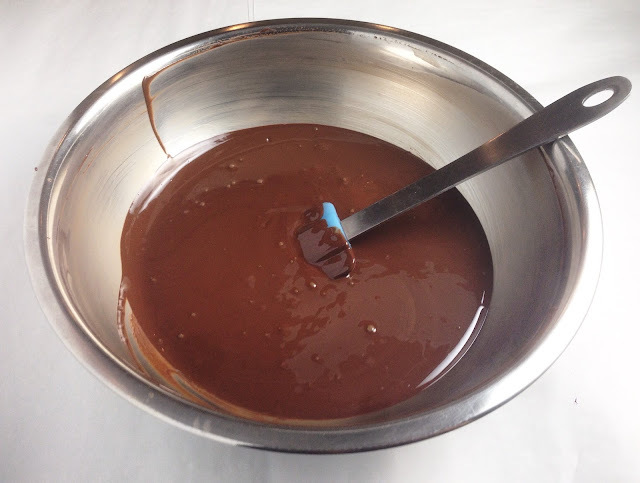 Working in batches (I would recommend no more than six strips at a time), dip one side of each strip in the Tempered Chocolate and drag it along the edge of your bowl to smooth the surface and remove any excess Chocolate. 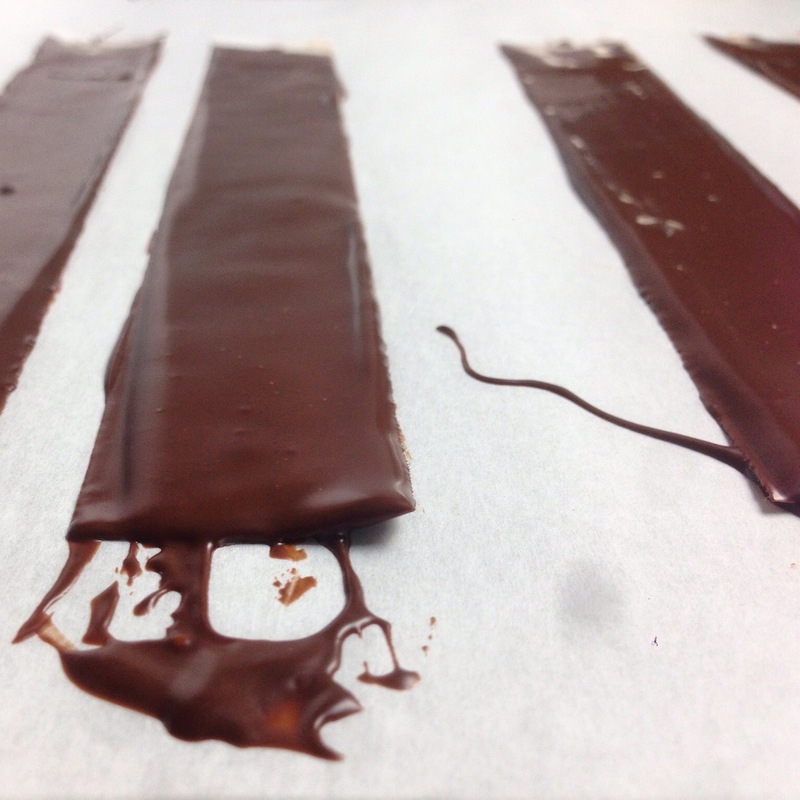 You want the strip to be well-coated, but you do not want the Chocolate to be too thick. Try not to get any Chocolate on the backside of the strips. When the Chocolate finally sets, it will be difficult to remove the parchment without breaking the Chocolate loop. 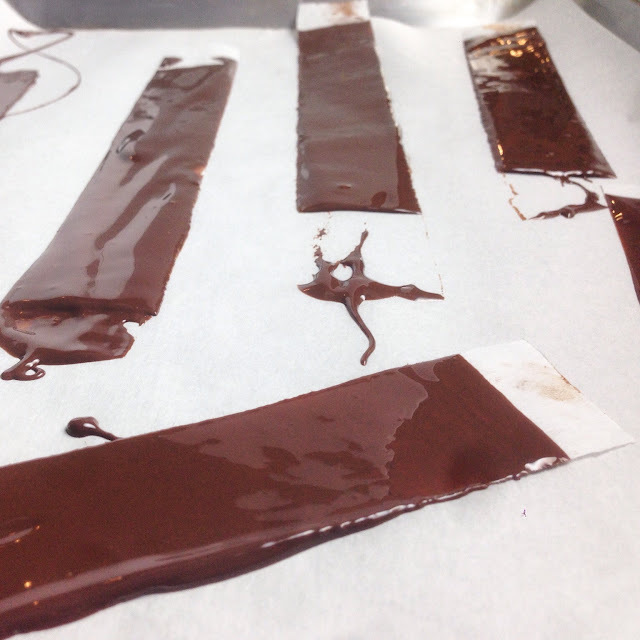 Lay each Chocolate coated strip on a clean sheet of parchment so that the Chocolate can begin to set. If the Chocolate is well-tempered and if the room is sufficiently cool, it should only take a minute or two for the thin layer of Chocolate to start setting. To keep the process moving (if you're comfortable multi-tasking), you can coat a second batch of strips while the first batch sets. Once the Chocolate is partially set but still pliable, fold the strips into loops with the Chocolate coated surface on the inside. You can vary the size of the loop based on where you connect the ends. The Chocolate loops will take time to fully set. Place the Chocolate loops safely to the side as you continue to work. I find that muffin tins work perfectly as they hold the desired shape of each individual Chocolate loops. When the Tempered Chocolate has fully set (it should 'snap' when broken), carefully peal away the parchment. 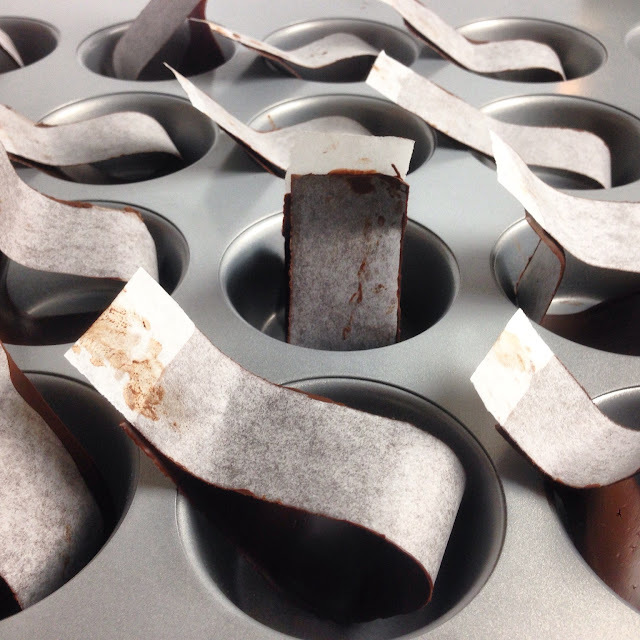 If the parchment does not remove easily, allow the Chocolate to set for a longer period of time. It is also possible that the Chocolate was not tempered properly. In a pinch, a few minutes in the refrigerator can help harden the Chocolate, making it possible to remove the parchment backing. As mentioned, the size and design of your final bow will dictate the number of individual loops you need. You'll likely have a few pieces that break when you remove the parchment. Good thing you made extra! What comes next is all about assembly. 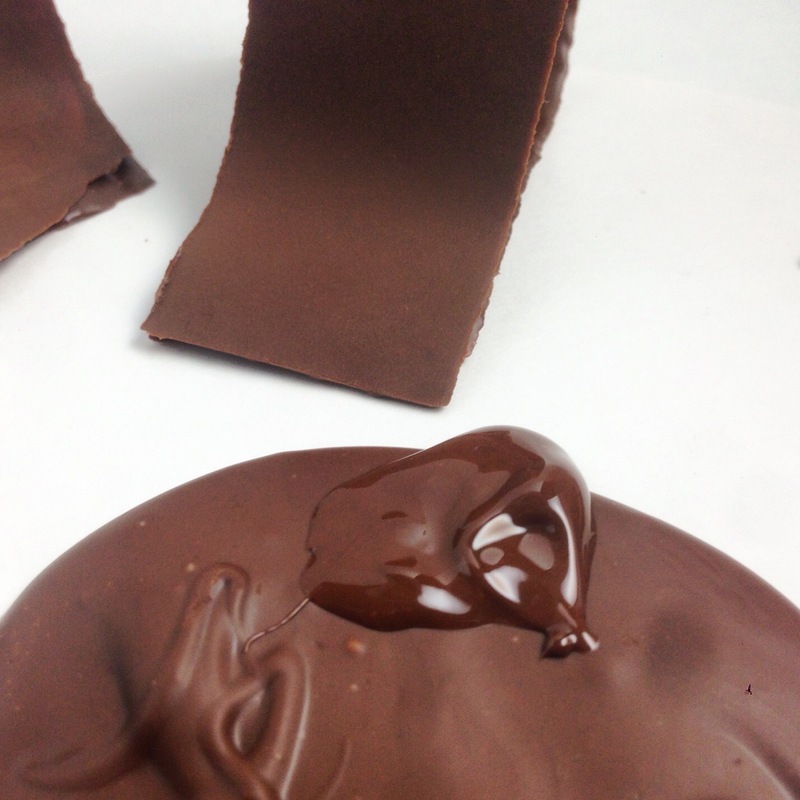 Start by making a simple base for your Chocolate Bow by pouring a small circle (i.e. ~3") of Tempered Chocolate on a cake round or other easily moved work surface. Once the Chocolate has started to set, begin assembling your bow. Start by 'dry fitting' the first layer of loops (i.e. arranging the pieces without applying any Chocolate as glue). This will be a process of trial and error to see which of your many loops fit best. Take care to handle the Chocolate loops gently. Make sure that your hands are clean and dry, and try to keep contact with the loops at a minimum. This means working quickly and limiting actual contact with the Chocolate. If you're like me and your hands are mini blast furnaces, you'll need to do whatever possible to keep finger prints off those loops! A bowl of ice water for frequent hand dunks isn't out of the question. The above picture is of an ambitiously large bow with eight loops in the first layer. You may be better off starting smaller with five loops. Set yourself up for success! If any of the loop tails (the part of the loop where you folded the ends together) are too long, shorten them by slowly and gently cutting them with a warm, sharp knife. Once you have determined your desired arrangement, attach each Chocolate loop using Tempered Chocolate as the glue. A small, offset spatula is perfect for the job. Build a second layer of Chocolate loops on top and inside of the first layer. You will most likely use fewer loops for this inner layer. For example, if your first layer used five Chocolate loops, expect this second layer to require four or even three loops. As with the first layer, dry fit each piece to gauge the fit before gluing anything in place. 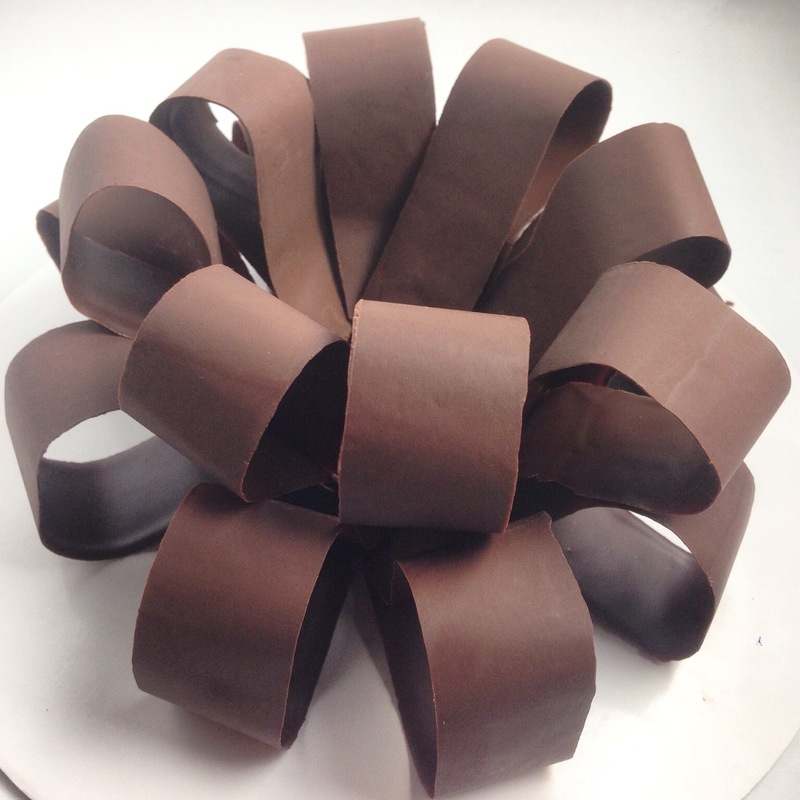 Depending on the size of your Chocolate Bow, you may want to add a third layer with a few of your smallest loops. 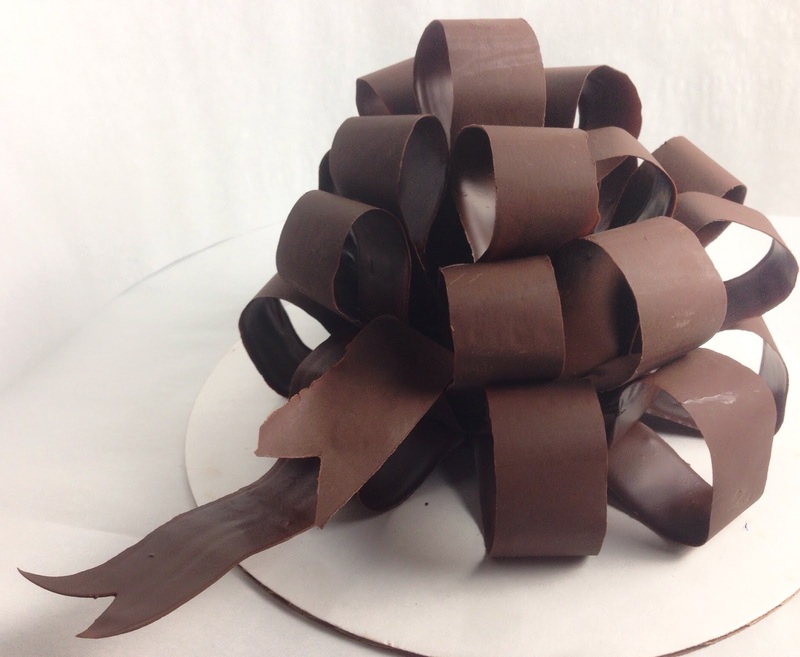 The final Chocolate Bow can be embellished with "tails" - wavy strips of Tempered Chocolate that look like the ends of a long piece of ribbon. 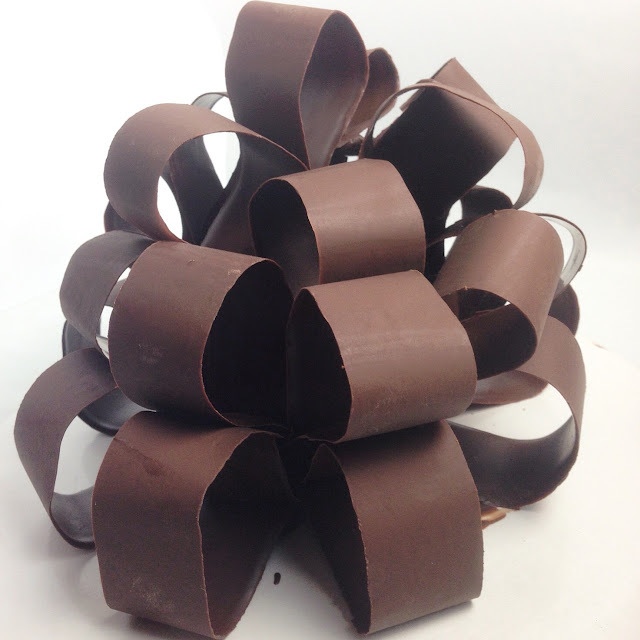 The Chocolate Bows can be used as the ultimate flourish to a multitude of decorative desserts. How can you say "no" to a cake topped with one of these?